Among the most beloved of Christmas pieces is surely the so-called “Huron Carol.” The carol’s text was written by St. Jean de Brebeuf in Quebec in 1642 or 1643 while his father recuperated from a broken clavicle, and set to a familiar French tune of the day, Une jeune pucelle. St. Jean composed the text in the Huron dialect (also known as Wyandot) that he had learned quite well. Fortunately, one of the later missionaries, Fr. de Villeneuve, wrote down the words and translated them into simple French; otherwise we would have lost it altogether. Behold, the spirit [demon] who had us as prisoners has fled. They are spirits, sky people [angels], coming with a message for us. Tichion, a star that has just appeared on the horizon, leads them there. He will seize the path, he who leads them there. the star was at the point of stopping, not far past it. saying “Hurray.” Jesus, he is born. Jésus est né, in excelsis gloria! Problems arise, however, when we get to the exceedingly well-known 1926 English version of the carol done by Jesse Edgar Middleton (1872-1960). 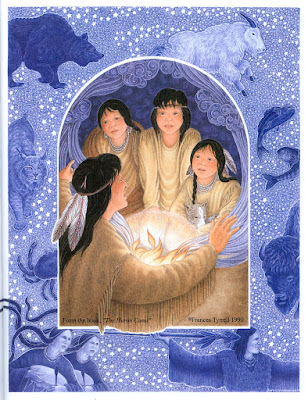 Middleton's version rather self-consciously enhances the “Indianness” of the text by stating that Jesus is born in “lodge of broken bark” and wrapped in a “robe of rabbit skin.” He is surrounded by hunters rather than shepherds, and chiefs bring him “fox and beaver pelts” instead of gold, frankincense, and myrrh. Most troublingly, Middleton gratutiously inserts the name of one of the pagan gods of the Algonquin, “Gitchi Manitou,” which is not in the original Wyandot version. Indeed, the very words “Gitchi Manitou” are from the Ojibwe language, not the Wyandot. Why is this a big deal? 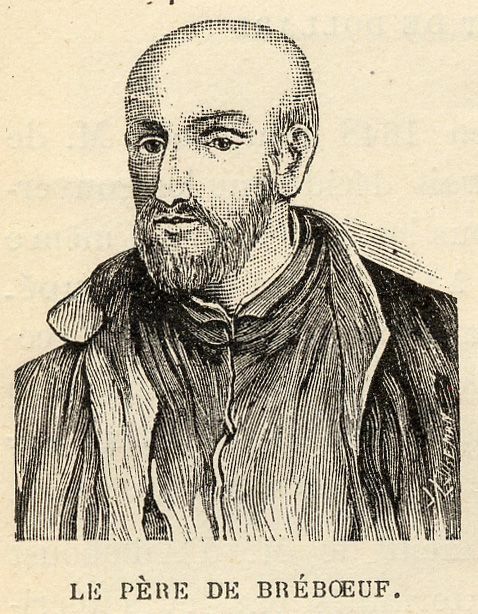 The answer is simple: Middleton’s familiar translation is not faithful to St. Jean de Brebeuf’s authorial intentions. With classic Jesuit ingenuity and precision, Brebeuf wrote a text that utilizes native concepts while simultaneously not asserting or honoring anything pagan. We, too, when singing this carol, should avoid the same. While it is true that “Gitchi Manitou” can be translated as “Great Spirit” and subsequently entered into common usage among Algonquian Christians (an insight for which I am thankful to a commenter below), in context it would be somewhat like those Renaissance Latin hymns that addressed God as thundering Jupiter. Years ago I composed a harmonization of the Huron Carol and published it in my Sacred Choral Works. I regret that I used Middleton’s text, the difficulties of which I did not grasp until much later, when a discerning musician wrote an email to me about all of these matters. How Mary Maid bore Jesus King. Iesus Ahattonnia, Jesus is born, Iesus Ahattonnia. For a fascinating scholarly article on this subject, see John Steckley, “Huron Carol: A Canadian Cultural Chamelion,” British Journal of Canadian Studies, vol. 27, n. 1 (March 2014): 55–74. Retrievable from ResearchGate.